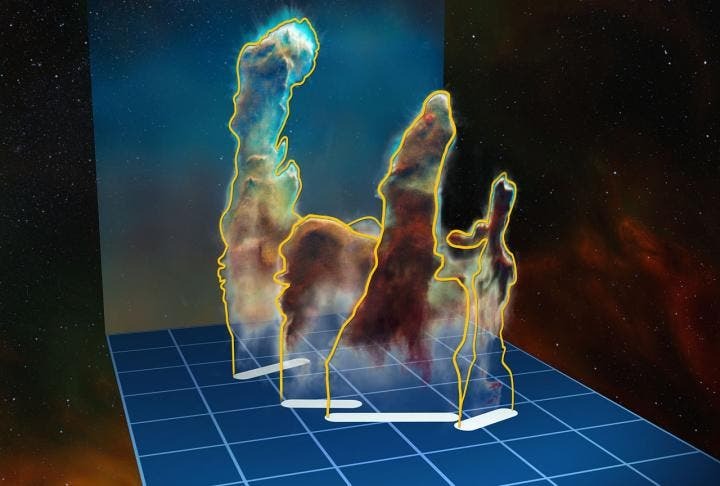 Using the MUSE instrument on ESO's Very Large Telescope (VLT), astronomers have produced the first complete three-dimensional view of the famous Pillars of Creation in the Eagle Nebula, Messier 16. The new observations demonstrate how the different dusty pillars of this iconic object are distributed in space and reveal many new details — including a previously unseen jet from a young star. Intense radiation and stellar winds from the cluster's brilliant stars have sculpted the dusty Pillars of Creation over time and should fully evaporate them in about three million years. The Pillars of Creation are a classic example of the column-like shapes that develop in the giant clouds of gas and dust that are the birthplaces of new stars. The columns arise when immense, freshly formed blue-white O and B stars give off intense ultraviolet radiation and stellar winds that blow away less dense materials from their vicinity. Denser pockets of gas and dust, however, can resist this erosion for longer. Behind such thicker dust pockets, material is shielded from the harsh, withering glare of O and B stars. This shielding creates dark "tails" or "elephant trunks", which we see as the dusky body of a pillar, that point away from the brilliant stars. ESO's MUSE instrument on the Very Large Telescope has now helped illustrate the ongoing evaporation of the Pillars of Creation in unprecedented detail, revealing their orientation. MUSE has shown that the tip of the left pillar is facing us, atop a pillar that is is actually situated behind NGC 6611, unlike the other pillars. This tip is bearing the brunt of the radiation from NGC 6611's stars, and as a result looks brighter to our eyes than the bottom left, middle and right pillars, whose tips are all pointed away from our view. By measuring the Pillars of Creation's rate of evaporation, MUSE has given astronomers a time frame for when the pillars will be no more. They shed about 70 times the mass of the Sun every million years or so. Based on the their present mass of about 200 times that of the Sun, the Pillars of Creation have an expected lifetime of perhaps three million more years — an eyeblink in cosmic time. It seems that an equally apt name for these iconic cosmic columns might be the Pillars of Destruction. "There is the only one thing that can light up a neighborhood like this: massive stars kicking out enough horsepower in ultraviolet light to ionize the gas clouds and make them glow," said Paul Scowen of Arizona State University in Tempe. "Nebulous star-forming regions like M16 are the interstellar neon signs that say, 'We just made a bunch of massive stars here.' This was the first time we had directly seen observational evidence that the erosionary process, not only the radiation but the mechanical stripping away of the gas from the columns, was actually being seen." "I'm impressed by how transitory these structures are. They are actively being ablated away before our very eyes. The ghostly bluish haze around the dense edges of the pillars is material getting heated up and evaporating away into space. We have caught these pillars at a very unique and short-lived moment in their evolution," explained Scowen, who, along with Jeff Hester, formerly of Arizona State University, led the original Hubble observations of the Eagle Nebula.